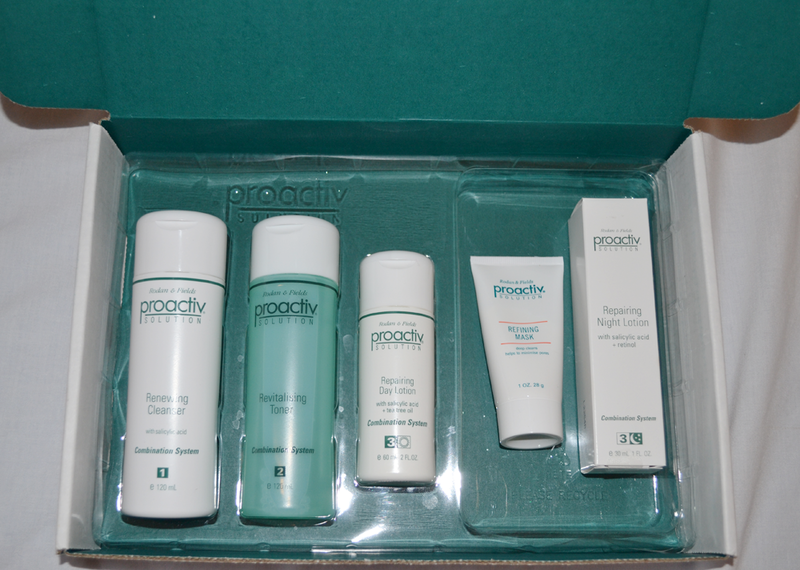 A few weeks ago my mum offered to buy me this proactive set after seeing it on offer for around £20 on TV. I have a lot of trouble with my skin, I’ve tried so many products and although some help slightly, I’ve never found anything that works just for me. It’s always been said that the best skincare routine is to cleanse, tone and moisturize so I gave Proactive’s set a go. I’ve been using this set for probably about 2 weeks which may not necessarily be long enough to have any dramatic effects but I have an opinion on it already, if this opinion changes I will do an updated post! The set has five products: A cleanser, toner, day lotion, night lotion and refining mask. I love how each product has a number on it and either a day or night icon, it’s super handy when you’re tired and not sure what one to use. The set also had a ‘Face Facts’ booklet which taught me a few things on how to improve my skin, most of it I already knew though. The cleanser is a greeny-blue colour with tiny granules in to open the pores up. I use a Body Shop cleaner designed for blackheads on my nose occasionally and find this helped a lot, however this particular cleanser & routine seemed to have no effect on my blackheads what so ever. Like most of the products in the pack, the cleanser doesn’t seem to have much of a scent. If it does, it’s slightly chemically rather than a nicer sweet, fruit smell. Only a small amount is needed and the product is rubbed in circular motions all over the dampened face. It is then rinsed off with some lukewarm water. Next is the toner. I have never used a toner before so I’m not the best person to review it. Regardless of this, the product is a greeny colour and only a few drops is needed. Again, it has a slightly chemically scent. I apply this with a couple of drops on a cotton pad after drying my face with a towel. I then let it air dry before the next step. The third step is the moisturiser. There are two different moisturisers, a morning one and an evening one. The difference between these two is that the morning one has tea tree oil whereas the night one has retinol. I’m going to be completely honest and say I have no idea what these do, although I’ve used a lot of tea tree oils before. Both of the moisturisers sink well into the skin and only a little is needed to cover the whole face. One thing that really irritated me was how easily the night time one comes out of the tube. It has such a huge nozzle and, on multiple occasions, I’ve squirted a ridiculously large amount out by accident. The final product, which is not part of the routine is the face mask. My initial thought on this was the smell. It was horrible. It’s hard to describe but it wasn’t chemical-y nor fruity. It was just a bit yuck. The product is fairly thick but can be applied with a thin layer and it is left for around ten minutes until is hardens. It is more of a clay mask rather than a peel off. Like the rest of the products, after applying it I didn’t see any major effects. Overall, I’m not particularly impressed with the proactive skincare set and haven’t seen any changes in my skin, I’m really disappointed because I had high hopes and believed this would cure me of my troubles! If anything, I have more spots and I’m not even sure that I’ll continue with the routine. What are your favourite cleansers, toners and moisturisers?